Monday: CT or Cat Scan, and mask mold. Tuesday: Off for the Patient, presumably the team planned out the therapy. 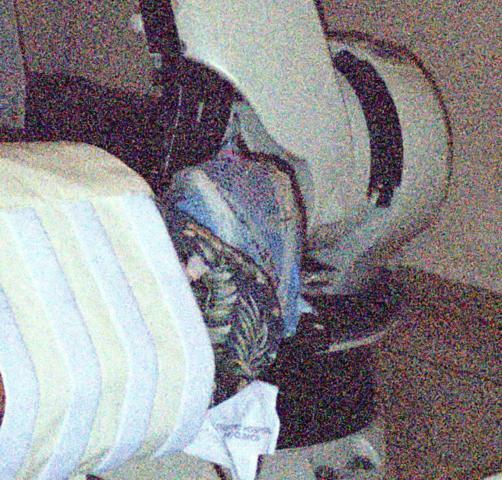 Wed through Friday, approximately 30 minute treatments per day. Each treatment was without pain. I sometimes imagined some soreness in the scalp each day, but as the sensation was not constant, I don't believe it was real. Discussions with Dr. Jackler indicate that maximum side affects from the treatment will occur at around 6 months from the treatment. 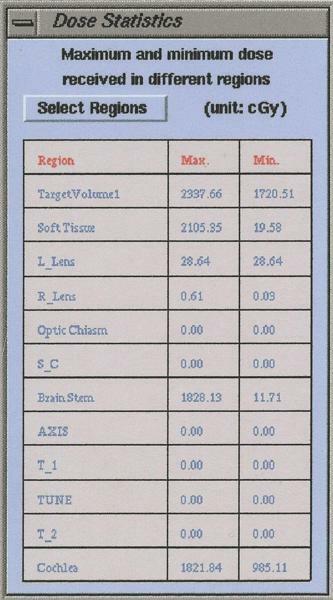 But this is a bell curve, and the data is from the Acoustic Nerve Neuromas, not the Facial. However, when I got home, and started to listen to sounds on my computer and my phones, my hearing has changed in the left ear significantly. I believe that the high end frequency loss is now much worse. I will be getting an audiogram to document this. But this is also not un-expected, and a cost of treatment that I have willingly taken. I will adapt. Dr. Jackler has asked that I do recordings of my facial movements so that as the 6 months passes, we can see what degradation and perhaps recovery has happened. So I will get to learn how to cut a DVD from my old 8mm Video-Cam. I may look to get more than 1 audiogram during this period as well. 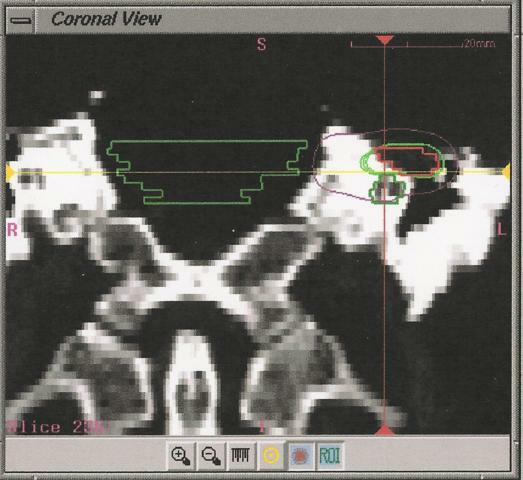 I will go back to Stanford after 6 months for a follow up MRI and consultation. Dr. Christian Cotrutz, PhD - Medical Physicist. 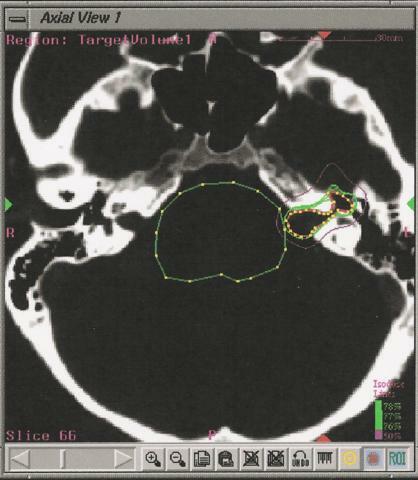 In the morning, I was given a CT Scan to image the Schwannoma in preparation for the Cyberknife treatments later in the week. I was given an injection of an iodine based die to help with contrast. This die was not needed for the actual treatments. At this time, a back pillow was made, molded to my neck and the back of my skull, and then a mask was made, molded to my face. 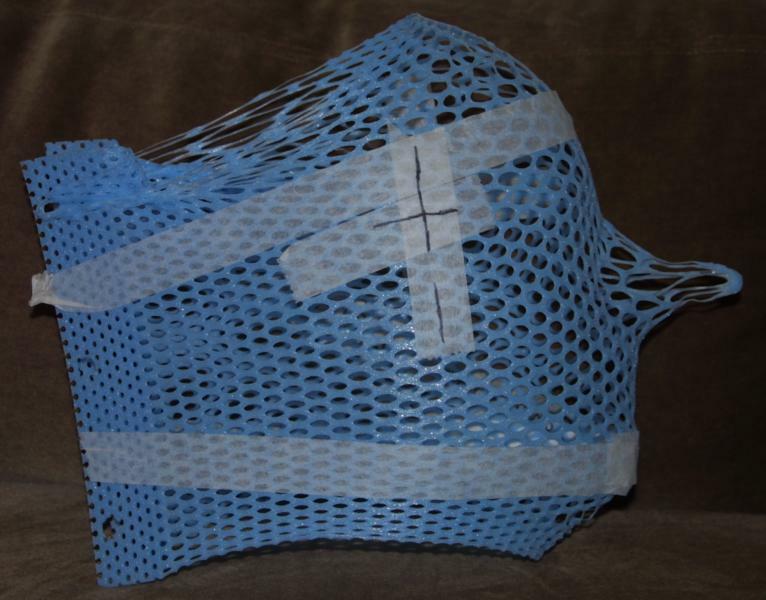 The purpose of the mask is to constrain movement of the head, but in a much more comfortable manner than what is done for the Gamma Knife. On the left you can see large holes which will go into cleats to fasten down the mask. On the right, you can see that they have stretched out my already large nose, to make breathing easier. 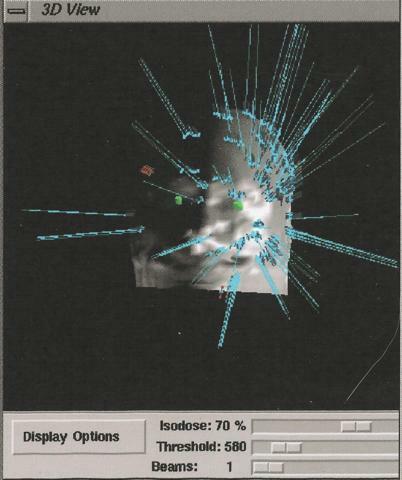 After the mold was set, I was put into the CT Scan. I was surprised how fast this was. It was only a couple of minutes. Perhaps that is because they only imaged around the schwannoma. 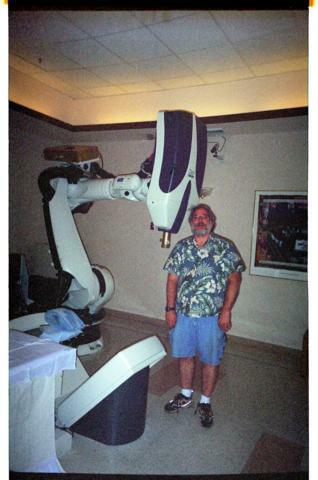 Then back to the waiting room while they made sure that the contrast was good enough. If it was not, I would have been sent over for an MRI. Since this was a possibility, they left the IV that was used for the iodine based die in so that if the IV was needed they had me set up for that procedure's contrast agent. Fortunately it was not, so the IV was pulled and we left. We had Tuesday off and headed up to wine country. Mid -morning we received a call that set up time times for Wednesday, Thursday and Friday. This is my big complaint on the Stanford infra-structure. From the beginning, Dr. Jackler said the standard procedure was imaging on day 1, and treatment on days 3 through 5. But in talking to the schedulers, et. al. there was always to me a large amount of uncertainty if this schedule would be held. Presumably, while Marina and I were up wine tasting, the team was developing the treatment plan. 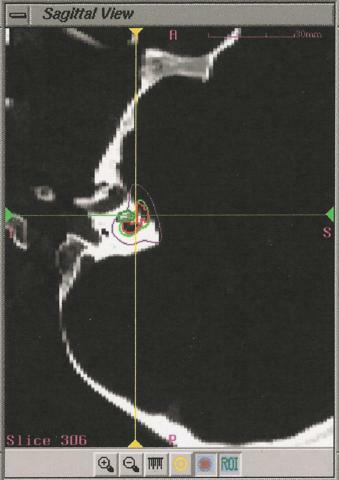 The schwannoma is easily visible on the right, outlined in both red (with yellow dots) and green. The oval in the center of the picture is the exclusion zone. 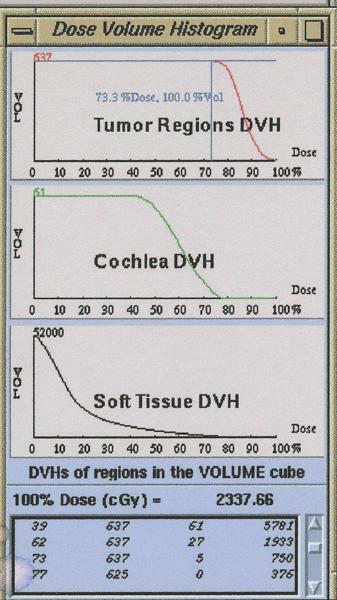 The red and green outlines are iso-dose levels. Dr. Jackler said the doles at the periphery of the schwannoma was targeted at 18 Centigrays (spelling?) and the interior at 20. This is total dose over three days. The only problem with day 1, is that the CD I had made of all slow movements of Beethoven's 9 symphonies did not work in the CD player. So I had Larry's soft music instead. I noticed two items while the beam was irradiating me. These two items repeated on days 2 and 3. 1) at one point in my left eye, I saw a flash, like the kind that comes from a camera. 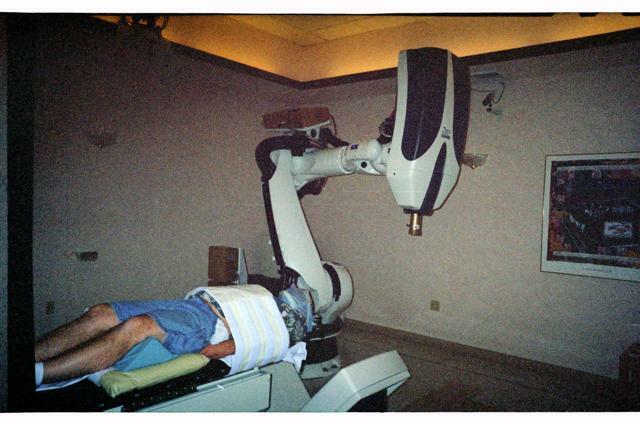 My eyes were closed for the duration of the treatment to protect them from a targeting laser beam. On day three, I signaled to Larry when this happened so that they could look at the beam line and perhaps learn something. 2) I also at one point had a sniff of what smelled like disinfectant. Larry attributed this to the beam passing close to my nose and sending some ozone into my nose. At the end of the treatment, I took the anti-inflammatory steroid and was on my way, no worse for the wear. I did not sleep as well that night, which I attribute to the steroid. Dr. Jackler said that a side affect of this was being wired. Basically the same as day 1. However, I did buy a CD with Oboe and Bassoon concertos on it and used that music. Again that night I had issues sleeping, and I noticed that in my left ear, I could not hear the crickets outside the window. More or less the same as days 1 and 2. My throat was dryer than on the previous days, and I was swallowing much more. Larry had to stop the treatment and slightly reposition me in the middle of the treatment. The dryness could have been due to the treatments, the steroid, or just coming down with a cold. At the end, I discussed with Dr. Jackler when to come back. I will head back in 6 months for another MRI to see check the status of the schwannoma. Dr. Jackler stated that in terms of side affects, the peak of the bell curve would be at 6 months, so I can expect a gradual worsening over the next half year. He suggested getting a digital video-recorder and filming myself going through facial exercises. I will do this about once per month, then cut a DVD to take back with me. I will also keep a medical diary.